Properties in Sovazza average 4.4 out of 5 stars. Country Cottage / Gite - Orta San Giulio:House surrounded by nature. 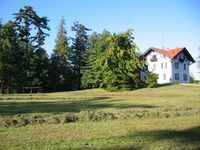 Property 4: Country Cottage / Gite - Orta San Giulio:House surrounded by nature. House with garden. View on Lake Orta and Monte Rosa. Wifi. Heated spa. Property 9: House with garden. View on Lake Orta and Monte Rosa. Wifi. Heated spa. We really enjoyed it! The place is great! We loved the tennis court, bbq, table tennis, and the silence at night! Fantastic view! The beds are a little on the old side but nothing too serious. Exceeded all expectations...a truly wonderful place. 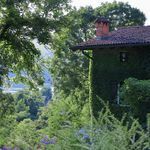 When our family arrived at this home, we were overwhelmed by the beauty of both the house and the site, which overlooks Lake Orta. We were greeted by the owner, Piero, and the property manager, Giorgio, who was always available to answer questions or attend to any matters. It is clear that this home has been lovingly restored with great care, devotion and sensitivity. The one and only downside to the property was having to leave. We hope to return very soon. Our sincere thanks to Piero, his family, and Giorgio.